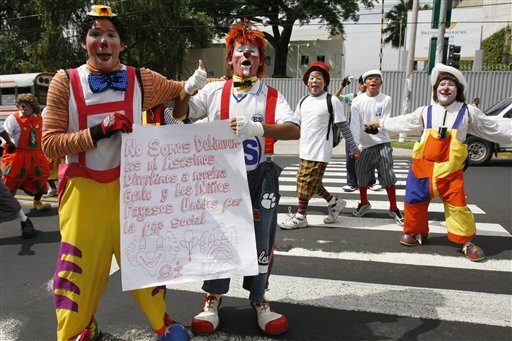 About 100 professional clowns who make money by performing on public buses marched through the Salvadoran capital Thursday to protest the killing of a passenger by two impostor clowns. On Monday, a man was shot five times in the face and stomach when he declined to give money to two assailants dressed as clowns who boarded a public bus. No one has been arrested. The protesters — wearing oversized bow ties, tiny hats and big yellow pants — marched down San Salvador’s main street in an effort to both entertain and educate passersby. Several held signs insisting that real clowns are not criminals. Clown-union leader Carlos Vasquez says he plans to issue IDs to all real clowns and urge police to detain those who do not have them.